I recompiled Ascemu and updated the database accordingly. 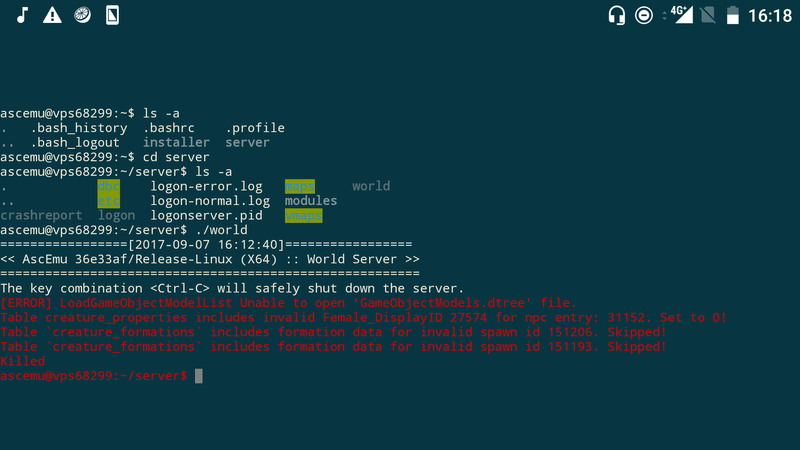 However, now whenever I try to run world, it just bombards me with errors, and honestly I have no idea how to fix this. Is that what you asked for? I'm currently trying to get the WotLK server to work. However, I'm not sure how compiling TBC or Cata would work. The post was edited 1 time, last by marcoooootje1 ( Aug 15th 2017, 12:01am ). sorry I was busy... do you have the correct dbc? You need to export them from your client. I do have all those required folders in the same directory as world.exe. They have been extracted from a 3.3.5a client and seem to work just fine when I run them with Arcemu. Do you think there is a step I'm missing to get it to work with Ascemu? Or maybe Arcemu modified them in a way so that they're not compatible with Ascemu anymore? I will try reextracting them and see if it does anything. Update: Little problem, I can find the vmaps extractor, but nothing else. And also there is some info missing on this page ascemu.org/wiki/index.php?title=3.3.5_Ubuntu , like how to extract the DBCs. There seem to be a lot of things that are clear to more experienced people, but I don't really understand what I'm doing wrong. Don't mean to sound like I'm complaining btw. You're awesome! The post was edited 1 time, last by marcoooootje1 ( Aug 16th 2017, 2:47pm ). I'm not sure what's causing this but I'll try and dig into it over the next few days and see what I can find. I don't mean to nag... but I'm really not sure how to continue. I wonder if everyone is having the same problem or if it's just a few of us who did something wrong without knowing it. If it helps, I'm doing this over Debian and not Windows. 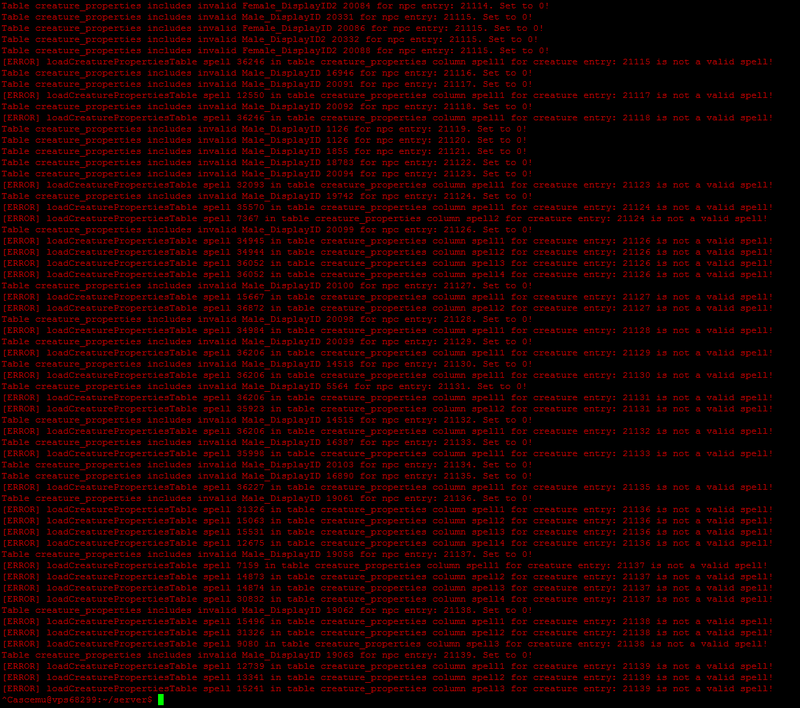 Maybe there's some missing Cmake arguments I need to add before compiling? No idea what those could be. I just tried building the server and reinstalling the dbs etc from scratch on Windows and didn't receive any of the issues you've had. It'll take me longer to test it on Debian, but I'll update you once I've had chance to. Apologies again for the slow reply! I can confirm that the issue is present on Debian, I don't know about other Linux distributions. I'll try to look into it once I can but as the issue is only present on non-Windows, it may take some time as I am unfamiliar with the platform. So I've managed to track down the cause of all the errors appearing and it's quite simple, because of the case-sensitive file structure on Linux you need to ensure the folder is named dbc, not DBC. I'll fix this in code later. Oh, I thought I did, but apparently you have to specify which branch you want to clone, instead of just copy pasting the git link and assuming it's fine. Sorry, I'm not very familiar with this. The only thing is now that I can't seem to connect to my server. I changed my realmlist.wtf file to connect to my server, I made an account with "account create" in logon, then reloaded. It appears in my database and it also says "1 account found" in the server log. But when I try to log in from my client it doesn't work. I can make it work with Arcemu, so I'm wondering what I'm doing wrong in Ascemu. Do I have to do something else with the realmlist.wtf file, or what do you think it missing? Nevermind the last part. I got something wrong with the ports and I forgot to double check. The post was edited 1 time, last by marcoooootje1 ( Sep 10th 2017, 4:04pm ).